TUESDAY, 15 MARCH – The K-Shopped and KopieSatu franchise will make its way to Universiti Malaysia Sabah (UMS) campus and this would give an opportunity for students to experience business acumen. Chairman of the Federal Agricultural Marketing Authority (FAMA), Tan Sri Badruddin Amiruldin said, FAMA had allocated a total of RM75,000 to set up K-Shoppe, which would be built in the near future under the Agricultural Graduate Entrepreneurship Club (MyAgrosis) UMS. “The running of business would be conducted by UMS students, and this effort would not only increase their knowledge in the field of business, but also provide opportunities for students to use their discretion in improving their skills. “K-Shoppe is a shop selling essentials and could bring profits for both students and the university,” he disclosed. He said this at a press conference at the Entrepreneur Motivational Talk and the launching of the MyAgrosis Club UMS at Dewan Bankuasi, UMS recently. He also explained that KopieSatu franchise would be built after the establishment of K-Shoppe store. According to him, KopieSatu is a local coffee shop drinks that have branches in universities. “After they graduate, those who want to do the KopieSatu business will be assisted by FAMA,” he said. 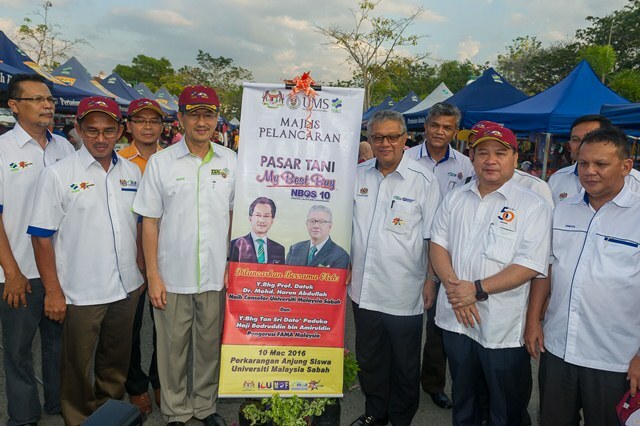 At the ceremony, Tan Sri Badruddin also officiated MyBestBuy at the parking lot of the Student Affairs Department UMS.